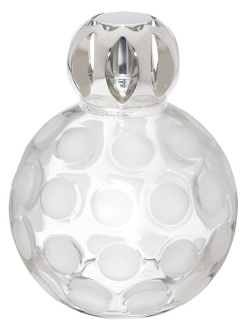 Lampe Berger's Sphere Frosted lamp with stained glass decorated with a sand blasted splotch design in the Art Noveau style is a beautiful lamp with real class. The lamp comes in a nice gift box with burner, tops, instructions and a funnel. We recommend this lamp.